When you have the best ingredients you do not need to do much to make them shine. 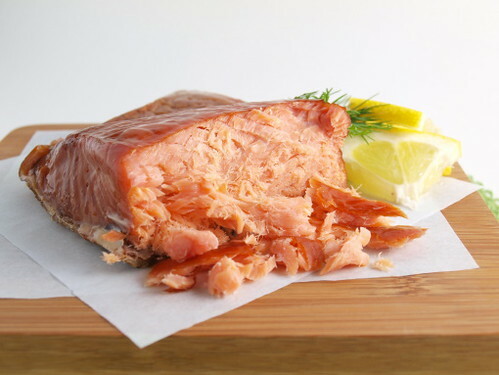 While in Seattle for IFBC I picked up some lovely Alder Smoked Salmon. On its own it is fantastic. One subtly smoked, tender taste had me happily handing over my cash. Once I got it home I decided to find some fun ways to turn this delicious snack into a full blown dinner. I was looking for something akin to my favorite smoked salmon nibble – potato pancakes with dill sour cream. 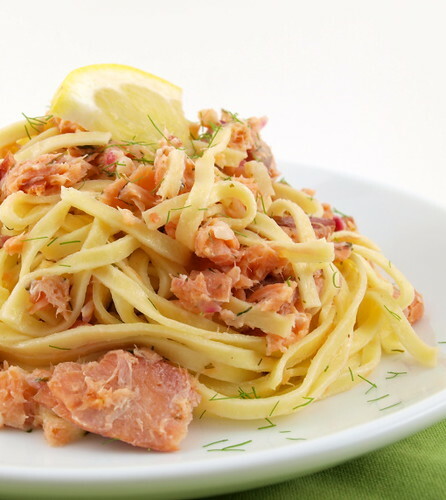 Breaking it down you have a starchy base, smoked salmon, and a little tangy sauce to bring it all together. Pinch hitting for the potato pancakes in my dish is fresh linguine, and the pasta is lightly coated in a light sour cream dill sauce. Oh yes, I had what I wanted! This is a very lightly sauced pasta. 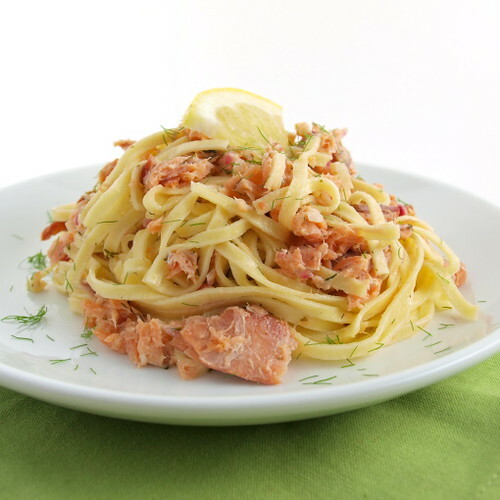 The tang of the sour cream and the zip of fresh lemon really brighten the dish, but with the richness of the salmon I kept the sauce to the minimum. Of course, if you want more sauce feel free to make as much as you like. Fresh dill is really a must here since it has the best herbal flavor with out making it only thing you taste. Dry dill is a little too pungent, and a little too grassy. If you do use dry, use only a teaspoon. 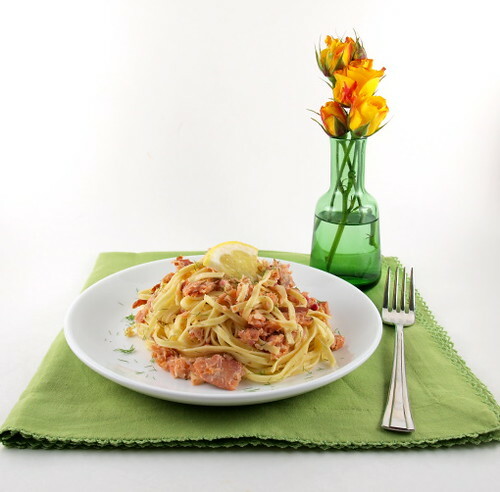 For me this is a perfect meal on its own, and with the simple, fresh flavors it is perfect anytime! 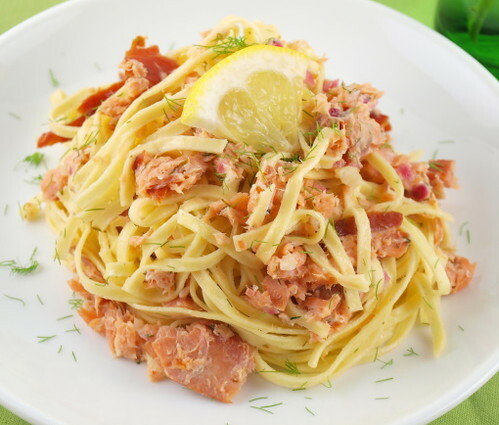 Cook the pasta according to the packaged directions in salted water. Drain and set aside. Over medium heat melt the butter with the olive oil in a large pot. 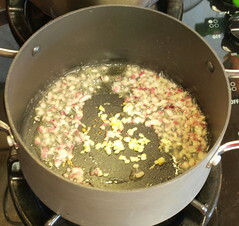 Once the butter is bubbling add the onion and cook until just soft, about three minutes. 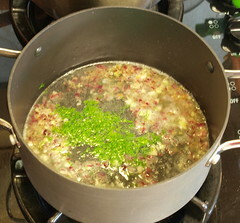 Add the garlic, lemon juice, wine, and dill and cook until reduced by half, about 5 minutes. Season with salt and pepper. 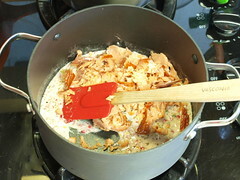 Reduce the heat to low and stir in the sour cream and salmon. Cook until heated, about one minute. Add the cooked pasta and toss to coat.